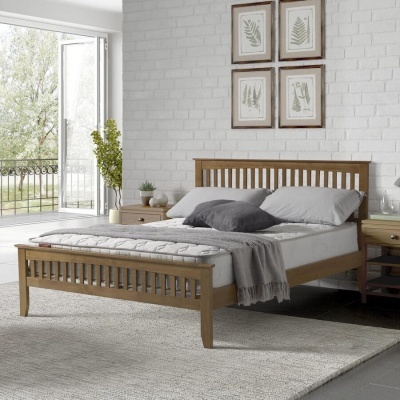 Give your bedroom a warm ambient feel with this chunky yet elegant grey and oak bed frame. Timeless country design works with most bedroom interiors. 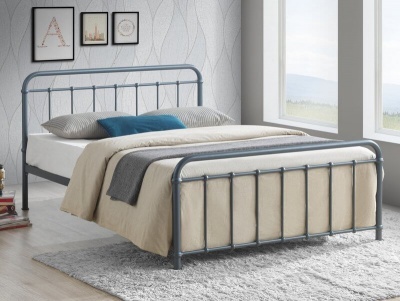 Easy clean lacquer finish helps to protect the Vinton bed frame from general wear and tear. Constructed from solid oak, oak veneer and pine. Steel centre support rail. 14 solid wood cross rails. Delivered flat packed for self assembly. Qwikfit components for quick and sturdy assembly. Part of our collection of painted grey bedroom furniture.